As the market for digital cameras erodes from the bottom up, major manufacturers are increasingly resorting to a more granular lineup. The Canon EOS 77D is a case in point, positioning itself in between the semi-pro, double-digit models such as the EOS 80D and the entry-level Rebels, currently headed by the Rebel T7i (EOS 800D). 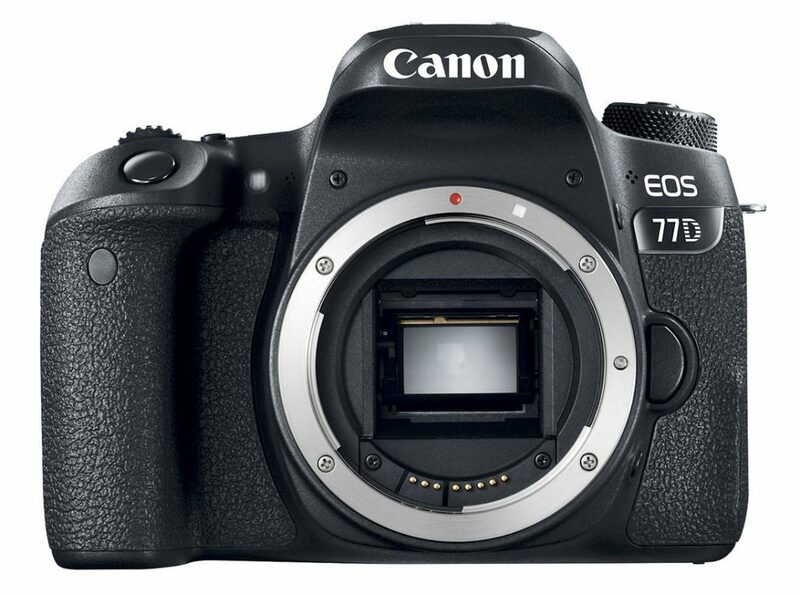 Although announced in early 2017, the EOS 77D uses the latest Digic 7 processor and Canon’s lauded 24MP CMOS sensor with Dual Pixel AF technology that enables the camera to autofocus with the mirror up in Live View when taking stills or shooting movie clips. As a conventional DSLR using an optical viewfinder, it has a 45-point AF system with all cross-type sensors, along with 95% frame coverage. The 77D shares sensor and autofocus specifications with both the Rebel T7i (EOS 800D) and its bigger sibling, the 80D. However, looking at the body and design, it has the ergonomics, handgrip, overall size and build of the smaller Rebel; and a similar but not identical layout to the EOS 80D, including the same twin control dials and top-plate LCD. 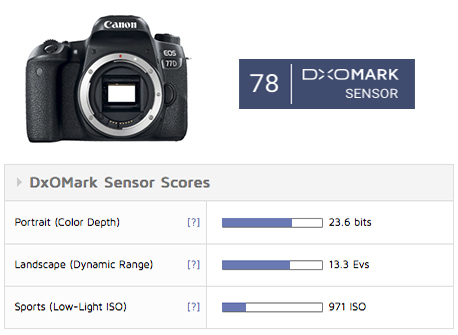 The Canon EOS 77D attained an overall DxOMark sensor score of 78 points and ranks as one of the best Canon APS-C sensors we’ve tested. It has pretty much the same potential image quality as the semi-pro-oriented Canon EOS 80D, and while we’ve yet to test the Rebel T7i/EOS 800D, the EOS 77D is a measurably better performer than the T7i/EOS 800D’s predecessor, the Rebel T6s/EOS 760D. Unsurprisingly, the Canon-designed and fabricated sensor delivers its best potential image quality at base sensitivity (ISO100). It is behind the best-in-class, but nonetheless achieves a good result of 23.6 bits for color depth. Although a dynamic range of 13.3 EV is good and more than enough in most cases, it is still some ways behind its rivals’ capabilities. However, the main reason for the only modest ranking is due to the sensor’s lackluster Low-light ISO result of 971 ISO. Featuring the innovative Dual Pixel construction, Canon’s 24MP APS-C CMOS sensor balances high resolution and sensor dynamics while offering such undeniable benefits as autofocus, including subject tracking during video. And Canon is improving the image-quality performance of its newer-generation models. Click here to open our interactive DxOMark image sensor ranking tool. While not quite at the level of the Nikon D5600, the Canon EOS 77D sensor’s sub-score for Landscape (dynamic range) of 13.3 EV reveals a substantial expansion of +1.3 EV over the previous generation Rebel T6s/EOS 760D, as well as a one-stop equivalent improvement in color depth, matching that of the pricier semi-pro EOS 80D. However, the improvements in performance don’t extend to the Sports (low-light ISO) score. There’s been no improvement over the older model, and at a difference of around –0.20 EV, it’s only a fraction behind the EOS 80D. Although it’s not enough to make much difference in practice against its sibling Rebel, it does make a difference when comparing it against the Nikon D5600. The Nikon’s sensor has an advantage of around +0.3 EV, allowing a higher ISO setting of ISO 1306 before reaching our image quality threshold. For more details about sensor performance, our in-depth analysis takes a closer look at how the Canon EOS 77D compares with the previous generation Rebel T6s/EOS 760D, and the rival Nikon D5600, a very competitively priced mid-range model with a similar-resolution APS-C sensor. Our analysis reveals that despite an improvement in color sensitivity over the older Rebel T6s/EOS 760D, the boost has mostly been as a result of an extended base ISO, rather than a specific advancement in sensor technology. Canon rates the base at ISO 100, but our measurements put it at ISO 56. Against the Rebel T6s/EOS 760D, the results admittedly look quite significant, but in practical terms, the advantages are restricted to the use of the lower ISO setting. Although it helps when comparing the three models at base, when looking at things from a different perspective, such as at ISO 200 (manufacturer’s rating), the Nikon D5600 has nearly the same color sensitivity (23.2 bits) as the EOS 77D at base, which is around 1.5 stops ahead and thus benefits from a higher ISO setting. Additional dynamic range is one of the most compelling attributes of sensor performance, benefiting users at all levels of experience and allowing them to capture a wide range of tonal levels, from highlights to deep shadows. It remains an advantage over sensors with less dynamic range when the exposure is less than optimal. The same lower base ISO advantage immediately impacts the EOS 77D sensor’s dynamic range. At this lowest ISO sensitivity, there’s a significant 1.3 EV improvement over the EOS 760D. It’s also evident from this that Canon has additionally tweaked the sensor’s response, with the result that the all-important dynamic range extends over the ISO 100–200 range. At ISO 800, however, the 760D takes a surprising lead over the newer model. In practical terms, it’s a relatively small advantage at these higher ISOs, and neither Canon model can match the sensor in the D5600 until around ISO 1600, where the older EOS 760D sensor is on par with the Nikon. At its lowest sensitivity, the EOS 77D achieves 41.5 dB in our signal-to-noise ratio (SNR 18%) tests, which is comfortably above our 38dB threshold. All three models perform similarly, however, with the sensor in the Nikon D5600 having lower noise and a slightly better response, which is more evident at lower ISO’s. When measured against our strict quality criteria of at least 18-bit color, 9 EV dynamic range, and an SNR 18% of no less than 30 dB, the EOS 77D sensor’s maximum sensitivity equates to just ISO 971. Although based on unprocessed RAW files, clean-looking processed JPEGs from the camera’s Digic 7 chip at ISO 1600 and ISO 3200 should be easily within the camera’s reach. As Canon’s range of DSLRs becomes more fragmented and adopts sensor technology that performs as well or nearly as well as mirrorless models, making a choice can only get more difficult. Still, on paper, the Canon EOS 77D has a lot going for it. It has some of the more tangible benefits of the semi-pro EOS 80D, such as a similar-performing sensor, autofocus, twin-control dials and top-plate LCD, and yet it’s as compact as the Rebel models and not much more expensive. When all put together, it makes a strong case as an upgrade from older models, and an appealing, well-rounded model as a first-time buy, especially if the price of the EOS 80D is too much of a stretch. In this review we have compared the Canon EOS 77D to its most direct rivals that we’ve tested. As usual, you can create your own comparisons and in-depth analyses using our interactive image sensor ranking tool.